Politicians in Belfast have delayed a decision on extending Sunday trading, as campaigners issued a warning over the effect on families. Today, councillors on the Strategic Policy and Resources Committee met to consider the change – less than a year after the last proposal was rejected. Campaigners from the Usdaw union held a protest against the change this morning, holding placards lamenting the effect of a change on family time. And ahead of the committee meeting, the union and independent retail organisation Retail NI urged councillors to reject the proposal. Sunday is the only time my family are all together. In the joint letter, the organisations said retail workers are “already under immense pressure to work long hours”. But they have the “one respite” of “legally enforced shorter trading hours on a Sunday which allows them much needed time with their family and friends”. Outside Belfast City Hall today, protestors held placards saying: “Sunday is the only time my family are all together” and “Sunday is the only time I get to be with the kids”. 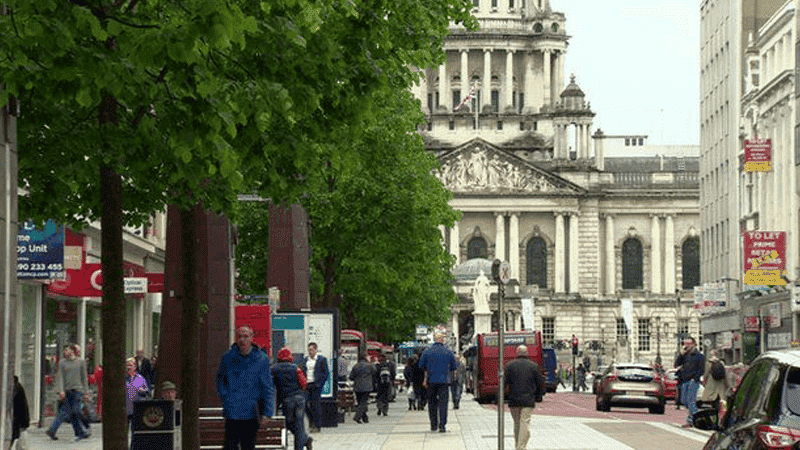 The change to Sunday trading is being considered by designating Belfast as a ‘holiday resort’ under Article 6 of Northern Ireland’s Shops Order 1997. But councillors have decided to defer the decision for a week for all interested parties to gather more evidence. In 2017, MPs at Westminster defeated the Government over plans to extend Sunday shopping hours in England and Wales. The vote saw off the Government’s second attempt in just a few months to pass the proposals.